This article is about the British intervention in Egypt in 1882. 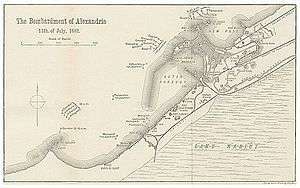 For the earlier war, see Alexandria expedition of 1807. For the conflict of 1956, see Suez Crisis. In 1878, an Egyptian army officer, Ahmed ‘Urabi (then known in English as Arabi Pasha), mutinied and initiated a coup against Tewfik Pasha, the Khedive of Egypt and Sudan, because of grievances over disparities in pay between Egyptians and Europeans, as well as other concerns. In January 1882 the British and French governments sent a "Joint Note" to the Egyptian government, declaring their recognition of the Khedive's authority. On 20 May 1882, British and French warships arrived off the coast of Alexandria. On 11 June 1882, an anti-Christian riot occurred in Alexandria that killed 50 Europeans. Colonel ‘Urabi ordered his forces to put down the riot, but Europeans fled the city and ‘Urabi's army began fortifying the town. The French flotilla demurred from direct hostilities but, an ultimatum to cease the arming of the town having been refused, the British warships began a 10½-hour bombardment of Alexandria on 11 July 1882. The reasons why the British government sent a fleet of ships to the coast of Alexandria is a point of historical debate, as there is no definitive information available. In their 1961 essay Africa and the Victorians, Ronald Robinson and John Gallagher argue that the British invasion was ordered in order to quell the perceived anarchy of the ‘Urabi Revolt, as well to protect British control over the Suez Canal in order to maintain its shipping route to the Indian Ocean. The British fleet bombarded Alexandria from 11–13 July and then occupied it with marines. The British did not lose a single ship, but much of the city was destroyed by fires caused by explosive shells and by ‘Urabists seeking to ruin the city that the British were taking over. Tewfik Pasha, who had moved his court to Alexandria during the unrest, declared ‘Urabi a rebel and formally deposed him from his positions within the government. ‘Urabi then reacted by obtaining a fatwa from Al Azhar shaykhs which condemned Tewfik as a traitor to both his country and religion, absolving those who fought against him. ‘Urabi also declared war on the United Kingdom and initiated conscription. The British army tried to reach Cairo through Alexandria but was stopped for five weeks at Kafr El Dawwar. In August, a British army of over 40,000, commanded by Garnet Wolseley, invaded the Suez Canal Zone. He was authorised to destroy ‘Urabi's forces and clear the country of all other rebels. Wolseley saw the campaign as a logistical challenge as he did not believe the Egyptians would put up much resistance. 5 August 1882 - this battle took place between an Egyptian army, headed by Ahmed Orabi, and British forces headed by Sir Archibald Alison. Seeking to ascertain the strength of the Egyptian's Kafr El Dawwar position, and to test local rumours that the Egyptians were retreating, Alison ordered a probing attack on the evening of the 5th. 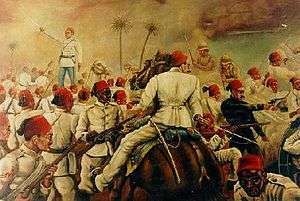 This action was reported by Orabi as a battle, and Cairo was full of the news that the advancing British had been repulsed. While, most historians describe the action merely as a reconnaissance in force which was never intended as a serious assault on the Egyptian lines. 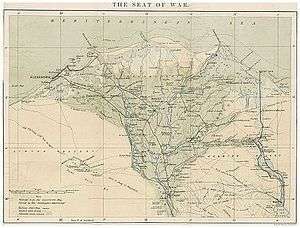 However, the end result was that the British abandoned any hope they may have had of reaching Cairo from the north, and shifted their base of operations to Ismailia instead. 13 September 1882 - Urabi redeployed to defend Cairo against Wolseley. His main force dug in at Tell El Kebir, north of the railway and the Sweet Water Canal, both of which linked Cairo to Ismailia on the canal. The defences were hastily prepared as there was little time to arrange them. ‘Urabi's forces possessed 60 pieces of artillery and breech loading rifles. Wolseley made several personal reconnaissances, and determined that the Egyptians did not man outposts in front of their main defences at night, which made it possible for an attacking force to approach the defences under cover of darkness. Wolseley sent his force to approach the position by night and attacked frontally at dawn. Officially losing only 57 troops while killing approximately two thousand Egyptians. The British army had more casualties due to heatstroke than enemy action. :130 The ‘Urabi forces were routed, and British cavalry pursued them and captured Cairo, which was undefended. Lieutenant William Mordaunt Marsh Edwards was awarded a Victoria Cross for his Galantry during the battle. During the build up to the battle at Tell El Kebir the specially raised 8th Railway Company RE operated trains carrying stores and troops, as well as repairing track. On the day of the battle they ran a train into Tell El Kebir station at between 8-9am (13 September) and "found it completely blocked with trains, full of the enemy's ammunition: the line strewn with dead and wounded, and our own soldiers swarming over the place almost mad for want of water" (extract from Captain Sidney Smith's diary), Once the station was cleared they began to ferry the wounded, prisoners and troops with stores to other destinations. In the wake of the advancing columns, telegraph lines were laid on either side of the Sweet Water canal. At 2 am (13 September) Wolseley successfully sent a message to the Major General Sir H Macpherson VC on the extreme left with the Indian Contingent and the Naval Brigade. At Tell El Kebir a field telegraph office was established in a saloon carriage, which Arabi Pasha had travelled in the day before. At 8.30 am (13 September) after the victory at the battle of Tell El Kebir, Wolseley used the telegram to send messages of his victory to Queen Victoria; he received a reply from her at 9.15 am the same day. Once they had got connected to the permanent line the Section also worked the Theiber sounder and the telephone. The forerunners of Royal Engineers (Postal Section) made their debut on this campaign. They were specially raised from the 24th Middlesex Rifle Volunteers (Post Office Rifles) and for the first time in British military history, post office clerks trained as soldiers, provided a dedicated postal service to an army in the field. During the battle of Kassassin they became the first Volunteers ever to come under enemy fire. British troops then occupied Egypt until the Anglo–Egyptian Treaty of 1922 and Anglo-Egyptian treaty of 1936, giving gradual control back to the government of Egypt. ↑ Robinson, Ronald; Gallagher, John (1961). Africa and the Victorians: The Official Mind of Imperialism. London: Macmillan. 1 2 3 4 5 6 7 Hopkins, A. G. (July 1986). "The Victorians and Africa: A Reconsideration of the Occupation of Egypt, 1882". The Journal of African History. 27 (2): 363–391. doi:10.1017/S0021853700036719. JSTOR 181140. 1 2 3 Galbraith, John S.; al-Sayyid-Marsot, Afaf Lutfi (November 1978). "The British Occupation of Egypt: Another View". International Journal of Middle East Studies. 9 (4): 471–488. doi:10.1017/S0020743800030658. JSTOR 162074. ↑ "The Bombardment of Alexandria (1882)". Old Mersey Times. Archived from the original on 8 October 2007. Retrieved 2007-10-13. 1 2 3 4 5 6 Porter, Maj Gen Whitworth (1889). History of the Corps of Royal Engineers Vol II. Chatham: The Institution of Royal Engineers. 1 2 Kochanski, Halik. Sir Garnet Wolseley: Victorian Hero. ISBN 9781852851880. 1 2 Porter, Whitworth (1889). History of the Corps of Royal Engineers, Vol. II. London: Longmans, Green and Co.
↑ Wells, Edward (1987). Mailshot - A History of the Forces Postal Services. London: DPCS. ISBN 0951300903. Wikimedia Commons has media related to 1882 Anglo-Egyptian War. Fiorillo, Luigi. "Alexandria Bombardment of 1882 Photograph Album". American University in Cairo Rare Books and Special Collections Library.